Music and movie star, Tonto Dikeh has had series of pregnancy related rumours that she kept denying even with her evident baby bump. A new photo emerged from Instagram moments ago with Tonto and obvious baby bump, she was seated at the back of a car with her husband and if anyone observe closely one will see the burgeoning baby bump. Tonto Dikeh shared the picture today but couldn’t wait for fans reaction before deleting it. “That’s a very, very good thing. I pray that I should be. Then again I don’t look pregnant. It’s something every woman should be proud of. 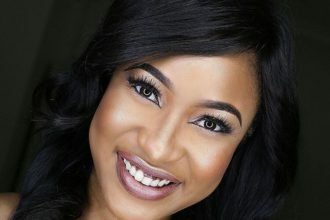 I hope it comes for me” said Tonto Dikeh. Ton will reportedly leave leave Nigeria any time soon to deliver the baby abroad. We shall keep you posted.